To say that I have dropped the ball with my blog would be understating the issue. I not only dropped the ball, I lost it down the drain and then decided the best way to retrieve it was to sit patiently by the grate for 3 months until a friendly rat (Snow White style) brought it back to me. But it’s okay, people. I know you have all been losing sleep over my absence, that you are about to call in the national guard (do we even have a national guard? What is the national guard?). I am still alive and well. I have just been doing other things. My own writing, for one. Working. Reading. You know, the usual. Now, I have always known I was introverted.When I did the Briggs-Meyer test, I got 100% on the introverted scale, which wasn’t a big revelation.I would have to be completely unaware of the term and of myself to not know it. I don’t like parties or crowds. I like small gatherings of friends and need to have some time alone in order to function properly. I have always had a problem speaking up in classroom or meeting situations and mostly would rather be reading. Geez, just look at my job: I am a school librarian who works mostly alone. Oh, I collaborate with people, and I enjoy these collaborations, but it is mostly on a one-on-one basis. So, I was curious when the book Quiet came out. Here was a whole book on introverts, my people. I think it is important to say from the outset though, that I have never felt my introverted nature was something other than just who I am, sort of like having brown hair instead of blond. It wasn’t something to be either ashamed or proud of. Some people are quieter than others, some are louder. The only time my introverted nature could be seen as a detriment is when I was being considered for a management position and the fact that I am allergic to schmoozing was seen as a negative. I was unprepared for the vehement, argumentative tone of Cain’s book (even though the whole raison d’être of this book is to prove the importance of introverts in positions of power). In short, this book made me uncomfortable. Perhaps it was because it was too close to home. Perhaps it is because one of the characteristics of an introvert is that they do not like to self-promote and this whole book felt like a self-promotion (ironic, hey?). But I think maybe it is because it is uncomfortable to focus on one aspect of one’s personality, to be so wholly one thing. It has always in equal parts surprised and appalled me when I meet those people who talk about themselves in absolutes -“I am a person who doesn’t take no for an answer” or “I’m someone who doesn’t like to plan” that kind of crap. How can you make such categoric statements? I can say that I am introverted, but I don’t like to call myself an introvert, like that is the word that sums up everything I am. And to read a whole book about that one thing (which admittedly is a big part of my personality) was kind of exhausting. Most of all though, it made me a little wary. There is a fine line between embracing certain parts of your personality and using it as an excuse not to do something. Not that Cain was advocating that at all, but I know for myself it is easy to use the fact that I don’t like crowds or parties as an excuse to not attend certain functions that I would probably end up enjoying. However, one of the points that Cain brought up in her argument was that introversion/extroversion is also a physiological trait. She cites some long term studies where babies who, after being exposed to certain stimuli tend to fuss more than other babies. Thos babies who respond in an agitated way turn out to be quiet, introverted kids, while the babies who are not so bothered by the stimuli turn out to be more extroverted. I was reminded of how it was for me to be at school when I was young- by the end of the day I was so exhausted by the white noise of the school environment, – the noises in the class, the lockers banging, the jostling crowds of rowdy students- that I would usually come home with a head ache and then need lock myself in my room until I could talk again. I had a similar experience when recently I went to Las Vegas. Let’s just say that I did not enjoy it. She also makes the point that many of the most successful CEOs and leaders have been and are introverts. That there is a particular leadership style that introverts have that will let a motivated workforce thrive under their supervision, which I think is an important point. We don’t all have to be the kind of people that fill their room with their overbearing personality to be a good leader. All in all, Cain’s book is an interesting exploration of the dynamics between the two different kind of personalities. But I am still left with a hesitant feeling towards this topic, one that does not let me jump wholeheartedly onto the bandwagon of dividing the world along these lines. This is just one part of the complex and infinite equation that define human relationships. Cain extracts and refines it here to make her argument, but once this piece is put back, I think it is important to remember that it is just part of an ever-changing, fluid whole. 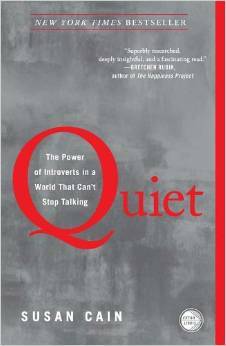 This entry was posted in Uncategorized and tagged ideas, introversion, Quiet by Susan Cain. Bookmark the permalink.